Imagine a stress-free Thanksgiving getaway in the Dells surrounded by friends and family- let us help you find the best place to enjoy your Thanksgiving dinner, the perfect place to call home for the long weekend, and endless fun for you to enjoy while you are here. Many indoor waterpark hotels and resorts will keep the entire family busy all day. Many resorts are offering their own buffets for Thanksgiving so you can enjoy the day without having to leave the resort. After you have enjoyed your feast, take the family bowling to Knuckleheads or Chalet Lanes for a little family competition. Be challenged by an escape room such as Booby Trap Escape Rooms or search for clues to solve at Wizard Quest to help rescue four imprisoned wizards! For the shoppers in the family, Wisconsin Dells is the place to be on Black Friday! We are home to Outlets at the Dells where Moonlight Madness will be happening Thanksgiving night starting at 8pm until 2am. You won’t want to miss out on these once-a-year Deals, Prizes, and Giveaways. Gobble up the savings! 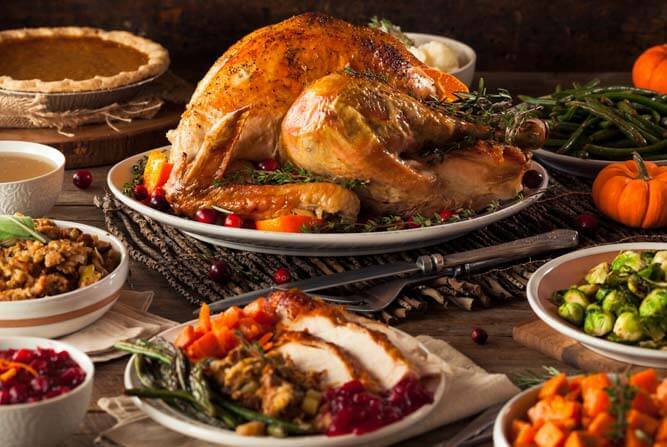 Enjoy Chula Vista’s famous Thanksgiving buffet featuring a wide variety of traditional favorites! Featuring Oven Roasted Turkey, Homemade dressing, Whipped Potatoes, Cranberry Chutney and Much more! Mouth-watering buffet featuring Chef Carved Roast turkey, New York, Loin Roast, Glazed Salmon, Butternut Squash Ravioli and all the traditional accompaniments! Enjoy Turkey, Sage dressing Gravy, Maple Glazed Ham, Swedish Meatballs, Spinach salad with Maple Pecan dressing to name a few favorites. Top off your dinner with Pumpkin Pie, Apple Cheesecake and Chocolate Mousse! Feast for the whole family to enjoy, from Turkey to Herb Crusted Prime Rib. Delight in several different entrees, meal enhancers, many desserts and chilled accents such as their famous salad bar. Even the kiddos will feel special with their own buffet just for them. Thanksgiving celebration like no other including a Chocolate Fountain. Take pleasure in customary favorites Roast Turkey, Molasses glazed Ham, Shepherd’s pie, Rice Pilaf with cranberries and almonds, and countless other scrumptious foods to tempt your taste buds. Make sure to verify details with establishments before making plans, the information provided above is subject to change. Also don’t forget to check out www.dells.com/restaurants for more great Wisconsin Dells dining options!